As the boat rocked in the bay’s choppy waters, nearing a place once known as America’s Devil’s Island, the priest gave the players rules. Remain calm, he told them. Stay on topic. Don’t do anything out of the ordinary. Reality started to settle in. This wasn’t like a banquet or ticker-tape parade or television appearance or anything the players did after winning a championship. This was different. Civilians aren’t allowed out here, the priest added. Don’t get too friendly. ON ALCATRAZ ISLAND, Calif. — John Hernan dug through memories from six decades back when he patrolled this rock as a correctional officer. And his 93-year-old blue eyes lit up at the mention of basketball. A heartbeat later, Hernan was presented with a black-and-white photo, dated 1956. In early August, Hernan ferried over to this windswept 22-acre island dotting San Francisco Bay for the 80th anniversary of the federal penitentiary’s opening, an event organized by the National Park Service, which runs Alcatraz as a historic site. Hernan was joined by fellow former officers, ex-convicts, and family members who lived here when America’s most notorious prison operated from 1934-63. But in the infirmary ward on the second floor of the ancient cellhouse, where park rangers served lunch, Hernan found himself discussing two Celtics Hall of Famers and a moment that has all but slipped through the cracks of time. He eyed the photograph, recognizing the faces: Bill Russell on the left, in the hat, and K.C. Jones in the middle, with the picturesque smile, both of them baby-faced, just weeks removed from winning a second straight NCAA title with the University of San Francisco Dons. And on the far right, a Jesuit priest, Father Richard Scannell. Then Hernan unspooled an improbable story that even his son had never heard; a story that historians, researchers, archivists, and others associated with the prison, the college, and the area had never heard; a story that some USF players on those teams had never heard; a story that, for some reason, never made the newspapers back then and stayed below the radar since. It is a story that has faded as those who were there when it unfolded fell ill or died. The few tied to Alcatraz who are still alive — many in their 80s and 90s — refer to themselves as an “endangered species.” But Hernan, who worked at the prison known as “The Rock” from 1955-58, was there. And he remembers. “I’ll never forget that day,” he said. 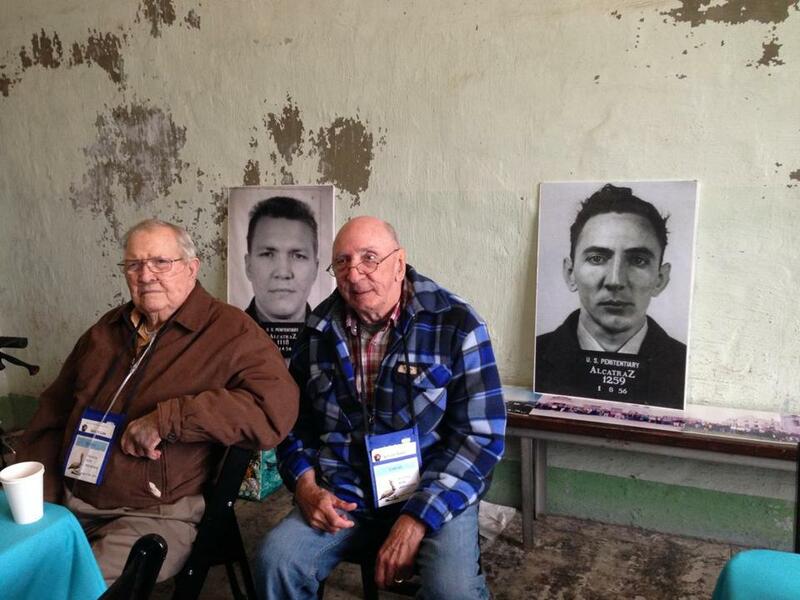 Former Alcatraz inmates Robert Luke (left) and Bill Baker with their prison mugshots. On that day, USF’s starting five — Russell, Jones, Hal Perry, Carl Boldt, and Mike Farmer — received an unprecedented tour of the prison while it still housed the worst of the worst, a collection of rotten apples US officials feared couldn’t be confined in any other barrel, a place especially suited for kingpin gangsters such as Al “Scarface” Capone, Meyer “Mickey” Cohen, and James “Whitey” Bulger. “The [convicts] looked at Russell and they were just in awe,” said Boldt, 81, a forward. Typically, civilians were never allowed beyond the visiting room, where they were separated from convicts by a thick glass partition, using a phone to communicate. Yet the players not only walked through the cellhouse, kitchen, hospital, recreation yard, and industry (where convicts worked), they even ate alongside them and met one who was segregated from all others: Robert Stroud, the famous “Birdman of Alcatraz,” a diagnosed psychopath serving a death sentence after killing a prison guard, his second murder. But it also tortured their psyche, for the mainland sat near enough, legend has it, that convicts could smell the sweet aroma wafting from the Ghirardelli Chocolate Factory, and could hear car horns and women’s laughter. The pleasures of a major metropolis were so close, and yet so far, separated by 1¼ miles of frigid water and cruel tides that swallowed several convicts during escape attempts. During the anniversary celebration, officers and ex-convicts recounted plenty of tales — many soaked in blood — that they would just as soon forget. “And every time I come back, I remember something else,” said Robert Luke, who as convict AZ1118 served from 1954-59 after attempting to escape Leavenworth Federal Penitentiary, where he was sent after being convicted of bank robbery with an automatic weapon. So the day Russell & Co. strolled through marked a true rarity: a memory convicts could savor. Which makes its lack of publicity all the more mysterious. For reasons no one can quite explain, the visit by the most popular sports team in the area — and the most dominant college basketball team in the country — stayed hidden, it appears, until Luke mentioned it halfway through his self-published book, “Entombed in Alcatraz,” released in 2011. A change that, however brief, allowed these notorious convicts to feel and act like regular joes, connected through something that has connected so many, no matter how different, for so long: sports. There is more to their trip, and to basketball’s story on Alcatraz. Radios. Gambling. Racial tension. A convict vote. Basketball goals erected in the recreation yard. Clint Eastwood. And, improbably, Rajon Rondo. And none of it would have unfolded without the warden, Paul Madigan. 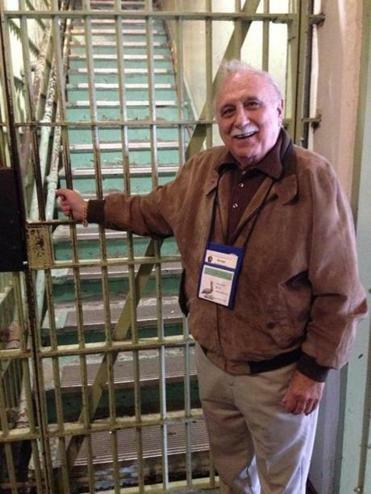 George DeVincenzi, who was born and raised in San Francisco, was a correctional officer at Alcatraz from 1950-57. There were no newspapers, magazines, radios, non-approved reading materials, or other forms of entertainment on Alcatraz. No discussing current events during once-per-month visits from family or friends. In short, no contact with the outside world. Regulations eventually loosened up, and a breakthrough came in 1955, when Madigan took charge. On Oct. 4 of that year, the Brooklyn Dodgers beat the New York Yankees in Game 7 of the World Series — and cheers echoed throughout the cellhouse as the nearly 260 convicts of Alcatraz listened along on radio headsets in their cells. According to Hernan, rumors of radio access had circulated for years, but Madigan, the third warden, was “the brains” behind the project. With Hernan supervising, a pair of convicts with backgrounds in electrical work installed two-channel radio jacks in each cell. From 5:30 p.m., when dinner ended, to lights out at 9:30, convicts could listen to either of the two stations, though George DeVincenzi, a correctional officer from 1950-57, said a control-center officer chose what programs were broadcast into the cells. Initially, DeVincenzi said, one station might carry Shirley Temple programming or a Hopalong Cassidy show, something of that sort. “Nothing of a crime nature,” he said. The second channel often aired sports programs, such as San Francisco 49ers football and — once they moved from New York — San Francisco Giants baseball games. To the convicts, Hernan said, the new privilege was like Christmas. When radio came to Alcatraz, the University of San Francisco, an urban Catholic school that didn’t even have its own gymnasium, was in the midst of one of the most dominant runs in college basketball history. Led by Russell, a 6-foot-9-inch center who picked the backboards clean and swatted almost every shot in sight, and Jones, a 6-1 defensive-minded floor general, the Dons won the 1954-55 championship and were steamrolling toward another a season later, with a winning streak that eventually reached a record 60 games and a style that would revolutionize basketball. A key element was coach Phil Woolpert’s “blitz,” which had the guards, especially Jones, applying hectic full-court pressure, forcing turnovers and cashing them in for layups. They could play extra aggressive knowing Russell had their backs. “Even if they broke the press and got down there in the middle, there he was, like a praying mantis,” said Bill Bush, 81, a USF guard. Russell boasted a monstrous 7-foot-4-inch wingspan, dinner-plate-sized hands that ultimately measured 10½ inches from wrist to fingertip, and as a college track star who excelled at the high jump, he could tattoo the backboard at 14 feet high. Behind its blitz, USF opened up huge early leads, essentially ending games then. 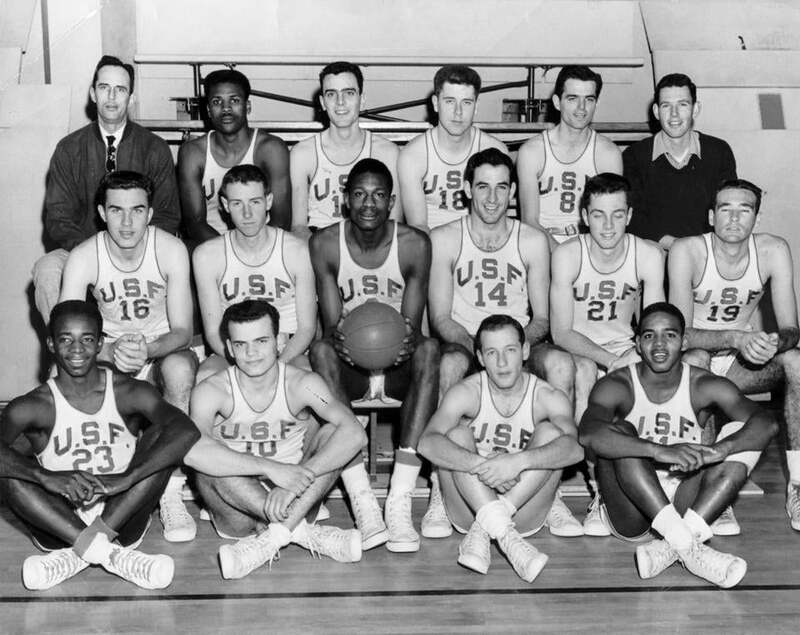 During the 1955-56 season, USF averaged 72 points while holding opponents to a measly 52. “That press, it just killed teams,” said Gene Brown, 78, a USF guard. The Dons hogged the local spotlight and dominated the San Francisco Chronicle’s sports section. “We were the darlings of San Francisco,” said Warren Baxter, 79, a USF guard. Naturally, USF games became a popular radio choice at Alcatraz, and even if many convicts weren’t from the area, they developed “hometown pride” in the Dons. But the games were more than entertainment for the convicts; they were a temporary escape from the harsh routine of their daily lives. Convicts spent at least 14 hours in their cells per day and up to 23 if they weren’t assigned an industry job. “One of our main distractions was sports,” said Baker, 81. It was also one of their only connections to the outside, such as in the prison’s early years, when loudspeakers in the recreation yard broadcast World Series games. “That was the only time I was there when they were allowed to listen to any kind of radio program,” said Frank Heaney, an officer from 1948-51. Just as radio came to the island, so too did newspapers. DeVincenzi said the Chronicle would deliver 25 copies of the sports section each day. “That was very, very popular,” he said. Baker recalled seeing the paper when he worked in the industry making white cotton gloves for the military. And so convicts ate up any news they could about the team. “You had to have something to get excited about on the outside, and that was one of the first things we had,” said Luke, 87. After his day shift at Alcatraz, Hernan attended night school at USF and saw many of the Dons’ wins. That season, the Dons became the first team in NCAA history to go undefeated, finishing 29-0, and Russell posted 26 points and 27 rebounds in the final against Iowa, an 83-71 win, giving the Dons back-to-back titles. And the convicts of Alcatraz wanted to meet them. Scannell taught at USF, but he was also the Catholic chaplain at Alcatraz and was especially close with Madigan, an Irish Catholic who always had a good relationship with the Jesuit priests. “If [the priests] wanted to do something, that was just fine with my dad,” said Florence Stewart, Madigan’s daughter. So when the convicts asked Scannell if USF’s players could come visit, Scannell asked Madigan, a former college baseball player in Minnesota and a big sports fan himself. The answer came back: yes. Scannell then went to the players. Boldt remembered thinking, “I want to go to that one,” knowing that not just anyone was allowed on Alcatraz. To Farmer, a forward, the request didn’t seem unusual at first. “You just thought it was one of those perks of winning a championship,” said Farmer, 78. A key reason the players were invited, Hernan said, was that it was believed their appearance would boost the morale of the black convicts. “The priest said, ‘They’ve been having a little trouble over there, and if you guys go over, it would help out,’ ” Boldt said. Inside Alcatraz, blacks and whites remained divided in the chow hall, the recreation yard, the industry. And the black convicts were heavily outnumbered; of the more than 1,500 convicts locked up during the prison’s 29-year run, about 78 percent were white and about 18 percent were black. Race was no foreign issue to the Dons, who in 1954 — the same year Brown vs. Board of Education passed, declaring school segregation unconstitutional — became the first team to start three African-American players: Russell, Jones, and Perry, a guard. That decision led to problems for the team, especially on the road. Some hotels wouldn’t house the black players. Some restaurants wouldn’t serve them. Some fans shouted obscenities and threw coins at them. “It was hell, it was hell,” said Gene Brown, who would become San Francisco’s first black sheriff. Russell, who was born in the segregated South, would become an outspoken advocate of the Civil Rights movement in the ’60s, marching on Washington with Dr. Martin Luther King Jr. But the Alcatraz visit proved to be among his earliest experiences with racial politics. For the visit, the team dressed sharply, in jackets and ties. “The warden told us, ‘When you walk through the cell block, they’re going to announce you’re walking through,’ ” Boldt said. The reaction was something the players wouldn’t forget. “They treated us like we were gods. I’m not kidding. Like rock stars. That was it. But they were truly fond of Russell, who averaged 20.6 points and 21 rebounds that season. “They looked at Bill Russell like he was God,” Boldt said. The convicts also brought up gambling, as it was popular for them to bet on games with cigarettes or food, such as a dessert or T-bone steak, said Pat Mahoney, a correctional officer and boat operator from 1956-63. The players ate lunch in the chow hall. Alcatraz was known for having the best food in the correctional system, thanks to its first warden, James Johnston. Knowing that most prison riots and strikes stemmed from poor food, Johnston, a strict disciplinarian, wanted to keep Alcatraz’s notorious residents well-fed. During the meal, they sat alongside convicts. Boldt said he ate next to Morton Sobell, then AZ996, who had been famously tried and convicted with Ethel and Julius Rosenberg on espionage charges, specifically delivering classified information to the Soviets about the atomic bomb. Boldt had followed Sobell’s trial and was thrilled to meet him. “He was very nice to me, and very smart,” Boldt said. The two stayed in touch after that, writing letters. Farmer recalled meeting another famous convict: Stroud, then AZ594, who had been sentenced to life in solitary confinement after stabbing a Leavenworth guard to death in 1916, transferred to Alcatraz in 1942. Other famous inmates during the time of the Dons’ visit included Ellsworth “Bumpy” Johnson, then AZ1117, a mob boss from Harlem, and kidnapper Alvin “Creepy” Karpis, then AZ325, a former Public Enemy No. 1. In San Francisco Bay sits Alcatraz Island, a.k.a. The Rock, site of a federal penitentiary from 1934-63, when it was home to some of the most notorious criminals in the country. The players walked through the industry, where Luke was working one of the industrial dryers. And when listening to the games, he heard Russell’s name constantly. Players also stopped near the island’s edge. “They [the correctional officers] showed us where they threw the food off the island to feed the sharks,” Farmer said. “That was always in view of where the [inmates] could see it, so they tried to attract sharks around Alcatraz there to keep people from trying to get away, I guess. Another stop was the recreation yard, Hernan said. Hernan walked them down Broadway to the main gate, where that photo he instantly recognized was snapped, the one featuring Russell and Jones, separated by a smiling DeVincenzi, who was about 30. Scannell and Lt. Emil Rickner were also in the picture. Both have since died. In August, DeVincenzi, now 88, stood near the spot where the photo was taken, and he smiled as he recalled that day. He was born in San Francisco, grew up there, and had followed the USF team very closely. “I was very happy to meet them,” he said. Farmer said the only time he remembered the trip being discussed was years later when he visited Jones in San Diego one night when the hometown Clippers were playing the Jones-coached Celtics. After the game, they gathered for dinner at a piano bar and discussed the visit. Those at their table wanted to know more. About two decades ago, Boldt searched newspaper archives for stories but found none. “I thought that was kind of odd,” he said. He said Alcatraz came up during a reunion for players from the two title teams held about a decade ago in Napa Valley. “How come nobody ever wrote anything on Alcatraz?” Boldt asked Jones. “You know, I was always wondering about that, too,” Jones said. But their tour didn’t mark the end of basketball on Alcatraz. Only the beginning. In the early 1960s, convicts at Alcatraz had a vote for a new sport in the recreation yard: basketball or baseball. Baseball was hugely popular. Future Hall of Fame slugger Stan Musial, following in the footsteps of the USF players, had visited the prison in 1960. And Warren Spahn, a fellow future Hall of Famer, stopped by, too. But basketball won out. A court was set up, concrete footings were poured (one is engraved with the date Aug. 10, 1961), and two goals were erected. Leigh Wiener, a Los Angeles-based photographer, captured the goals in some of his nearly 300 black-and-white pictures taken March 21, 1963, the day the prison closed. His son, Devik, rediscovered the photos, and several were on display in the old industry building, including a shot of a lonely basketball in a puddle near a wall. Another low-angle shot showed a single dumbbell and weightlifting plates strewn on one side of a chain-link fence; on the other, two basketball goals on opposite ends stand over an empty court. 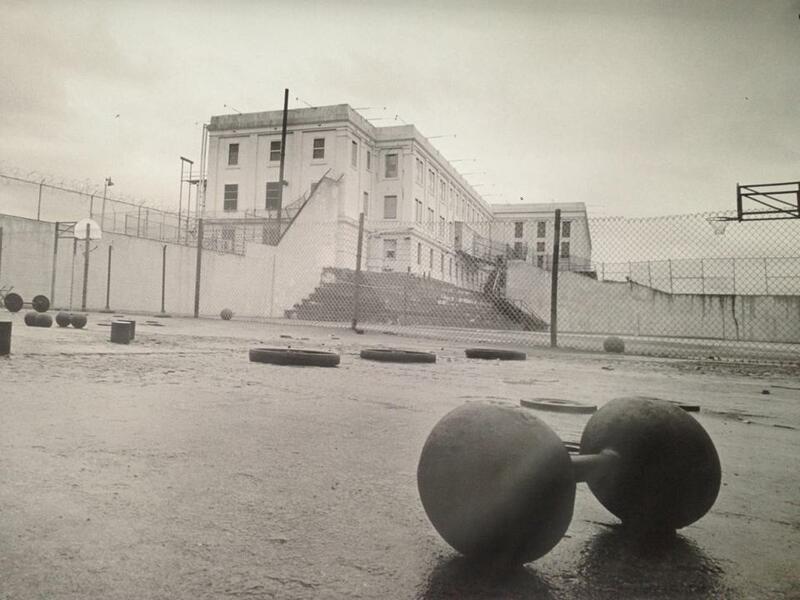 The goals were torn down during the on-site filming of the 1979 film “Escape from Alcatraz” starring Eastwood, because the filmmakers wanted to portray the convicts playing baseball in the yard. Today, there is little sign of basketball’s brief appearance at Alcatraz. A concrete footing remains near the pitcher’s mound on a small, dirt softball field, where four tattered white bases mark the edges. But basketball returned to Alcatraz nearly 50 years after the prison closed. In 2010, Red Bull held its inaugural King of The Rock Tournament in the yard, pitting 64 players from across the country against each other in a one-on-one, single-elimination, one-day event for a chance to win $10,000. The games were played on a half-court in the yard, with the cellhouse looming like a haunted castle. The cracked concrete became slick as a heavy fog rolled in, with the final game beginning around midnight. Watching over all of it was one of Red Bull’s sponsored athletes, a big name the company used to help drum up publicity for the event: Rajon Rondo, the Celtics’ All-Star point guard. For three years Rondo attended the event. He took photos, and viewed a few cells, including Capone’s. He learned the place’s history. This summer, while holding his basketball camp in his hometown of Louisville, Ky., Rondo was told by the Boston reporter about Russell, Jones, and their trip. He sat stunned. He shook his head. “Wow, that’s crazy,” he said. As inviting as the convicts were on that day nearly six decades ago, the USF players still knew they were in an infamous prison. “It was kind of weird to be walking along all these cells,” Farmer said. “And the cells weren’t that big” (the floor was 5 feet by 9 feet, about the size of a regulation pool table). Although many of the prisoners had notorious pasts, Farmer said the players felt safe during their several hours on the island. “I think because we were athletes, when we came in, they had an interest in what we were doing more so than trying to do something — show off about themselves, or anything like that,” he said. One moment crystallized that notion. Before Hernan walked the star basketball players down Broadway, a black convict named William Brunson made a request. “Can you arrange for Bill to wave to me?” he asked. “OK, I’ll see what I can do,” Hernan said. Russell obliged. And in that moment, with that simple gesture, Brunson was no longer just a former military member serving a 15-year sentence for murder. He was no longer just prisoner AZ822. In the amber of that moment, he was just a fan. Follow Baxter Holmes on Twitter @BaxterHolmes.